AM: Pick up and visit Tipon (temple of the water). Tipón is a magical place full of life and much water. We will feel how the water flows through the stone channels as if it was running through our veins. As we walk, we will start to flow together with the water until we feel our heart, and it will cleanse our spirit, so that we can continue to flow in this life. These are a megalithic series of sites up in the hills of Cuzco and have incredible water features (Tambo Machay) and massive technological construction that clearly predate Inca times. Free time in afternoon. We will explore the site of Uno Urco, and travel to Moray, where we will set up our camp on private land, and hold a traditional fire ceremony with the Shaman. 8:30 am aprox. 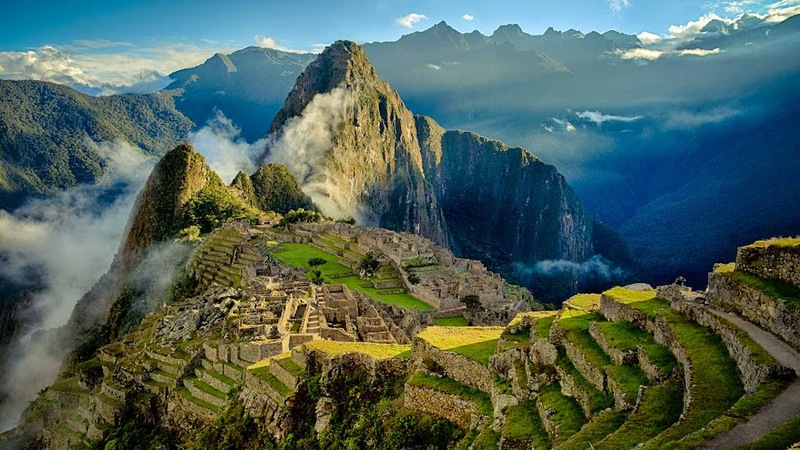 We’ll visit market at Chincheros and its Incan terraces. Also this tour includes Ollantaytambo. This is a large site of ruins characterized by fine masonry, which includes terraces, canals, granaries, fortress walls, and the Temple of the Sun. Overnight in a hotel in Ollantaytambo town. Early in the morning we will take the train to Aguas Calientes. Pick up and transfer to the hotel. In the afternoon we will take a hike to the sacred river, Rio Urubamba, for ceremony and sacred bathing and purification. 7:00 AM Pick up from the hotel. The excursion begins visiting Inca Anatawi, taking a car heading towards the south of the Titilaka refuge and then a moderate climb on foot to a rocky mountain, to reach an interesting Inca Trail remain where some polished stone seats were finely carved in large rocks, a vantage point for enjoying the panoramic view of the vast lake. After the descent, visit the local community for a brief rest and view their colorful textiles. Continue the journey south to visit the doorway of Aramu Muro, believed to be an inter-dimensional portal by local shamans. Then, visit the beautiful colonial churches of Juli and Pomata, which were the center of evangelization of the highland plateaus. The churches brag striking architecture, gold-leafed altars, still maintaining remarkable paintings from the vice royalty era and massive bells that still toll up to today. Return to Puno arriving at 7:00 PM Aproximately. 8:00 AM: we begin our circunlacustre journey appreciating the temple pre-columbus about half-day. The religious tradition stays alive in Ichu town in front of Thunuwire that today the Catholic religion continues congregating parishioners with the same importance that had this temple, free time to meditate, and to relax. Then we continue our journey going to the town of Chucuito. There we will Visit the Temple of the Inca Uyo, ceremonial center dedicated to the fertility, Lunch in a tourist restaurant. Then we will proceed to ascend to the summit of the hill Atoja, whose view is impressive, then you proceeds to carry out a ceremonial rite to invoke the Apus and purify our souls, reading of coca. Then we will carry out the descent to visit the colonial temples, piscicultura of trouts, and return to Puno city. We will appreciate extraordinary geologic formations on the route. Pick up from the respective hotel to take the car and go toward the Archaeological Complex of Sillustani; arrive to Sillustani, the great necropolis of the nation of Kolla, takes the North road of Puno in the road to Juliaca, until the town of Paucarcolla. The Chullpas is stone turrets considered as funeral monuments of the Kollas and Incas, built with more than 12m. of height, worked in stone, keeping the secrets of the cultures who populated in the highland for but of 3000 years. After That we continue to the Airport Juliaca.